One Eternal Day: "A pointer to...deeper sources of wisdom"
"A pointer to...deeper sources of wisdom"
.... 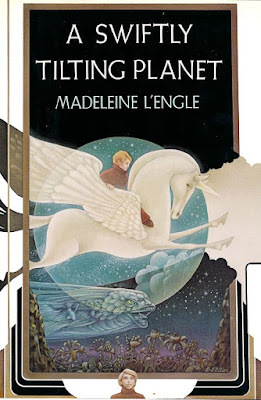 Whether or not her characters experience something as overtly supernatural as time or space travel, L’Engle’s concern lies not merely with the social and developmental struggles faced by teenagers, but with their spiritual lives. Just as Meg must learn to love in A Wrinkle in Time and the volumes of the earlier quartet, her daughter Polly O’Keefe must learn forgiveness in the later quartet. The final book, An Acceptable Time, culminates with Polly forgiving the offenses of a young man described as having been “out of [his] mind with self.” A wise elder character tells him, in language echoing Scripture: “Ultimately you will die to this life.” This unapologetically religious stance, along with L’Engle’s willingness to combine genres, kill characters, and quote difficult literature, doubtless accounts for both the enduring success of her works and their initial difficulty in finding a publisher, with A Wrinkle in Time famously having been rejected more than twenty times. "My flesh and my heart may fail, but..."